Columbus Blue Jackets left wing Nick Foligno (71, middle) celebrates his goal against the Tampa Bay Lightning with center Alexandre Texier (42, right) and defenseman Scott Harrington (4, left) during the second period of Game 1 of the first round of the 2019 Stanley Cup Playoffs in Tampa, Florida on Wednesday, April 10, 2019. Columbus Blue Jackets captain Nick Foligno became incensed by a Steven Stamkos punch late their Game 3 win over the Tampa Bay Lightning. 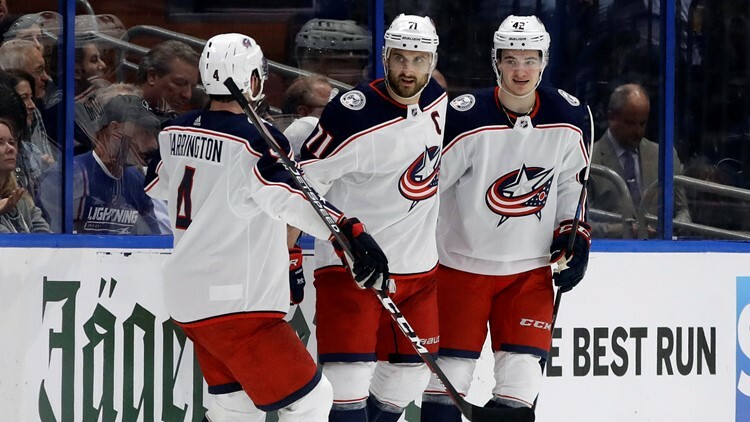 The Tampa Bay Lightning were, far and away, the NHL’s best team during the regular season, but the Presidents’ Trophy winners have not been able to find their footing against the Columbus Blue Jackets in the first round of the 2019 Stanley Cup Playoffs. At the end of their Game 3 loss to the Blue Jackets at Nationwide Arena in Columbus Sunday night, that frustration boiled over in a scrum. After taking a hit after the whistle from Riley Nash, Lightning captain Steven Stamkos responded physically and forced the officials to step in and break up the fracas. As Stamkos was being pulled away from the pile, he threw a left hand that landed flush against the nose of Blue Jackets captain Nick Foligno, and understandably, that did not sit well with Columbus’ on-ice leader. Incensed by the punch, Foligno tossed aside his stick, “dropped the gloves” and went after Stamkos. Despite a linesman being in-between the two, he attempted to fight back before being ushered away from the scrum. Foligno and Stamkos continued to jaw back and forth before play resumed. This was far from the first time members of the Blue Jackets and Lightning exchanged fists on the ice in the first three games of their best-of-seven series. Even mild-mannered Columbus defenseman Zach Werenski had his first NHL fight in Game 2 and finished off a “Gordie Howe Hat Trick,” meaning he scored a goal, handed out an assist and dropped the gloves on the same night. 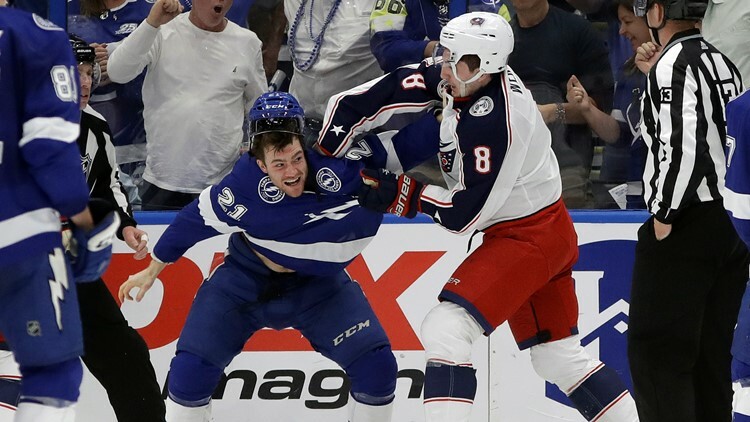 Tampa Bay Lightning center Brayden Point (21) and Columbus Blue Jackets defenseman Zach Werenski fight during the first period of Game 2 of the first round of the 2019 Stanley Cup Playoffs in Tampa, Florida on Friday, April 12, 2019. In front of the third-largest hockey crowd in Nationwide Arena history, 19,224 raucous fans who spent most of the evening chanting their support, the Blue Jackets fought their way to a 3-1 win over the Lightning in Game 3 of the first round of the 2019 Stanley Cup Playoffs. With their third consecutive win over the Lightning, the Blue Jackets took a commanding 3-0 lead in the best-of-seven series. The Blue Jackets could advance beyond the first round of the Stanley Cup Playoffs for the first time ever with a win in Game 4 in Columbus Tuesday night. The Lightning went the entire regular season and more than a calendar year without losing three consecutive games before the first-round matchup with the Blue Jackets.